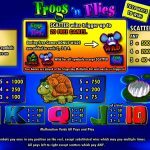 Frogs ‘N Flies and turtles are everywhere in the latest video slot game coming from Lightning Box. We are inside a beautiful pond where the symbols float freely. While you are waiting between spins, if you want to change the settings you will be entertained by some nice animations like the turtle tap dancing and the lilies opening. The symbols that we want to see more often in this game are the wild and the scatter. The cheerful looking frog is the wild symbol and it appears on the second and the fourth reel. The wild will stand in for every other symbol to complete a winning line except for the scatter. 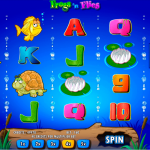 The Frogs ‘N Flies symbol is the scatter and it is the key to the free spins round. To activate the feature you need to land at least 3 scatter symbols for which you will receive 5 free spins and 40x bet payout. But in case you trigger the feature with more scatters of course those numbers will increase. 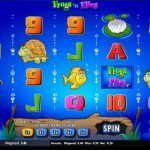 For 4 scatters you will receive 10 free spins and 200x bet payout and for 5 scatters you will receive 20 free spins with 5000x bet payout. Great news is that there are extra wilds added during the feature too. Frogs ‘N Flies seems like a very interesting game to play. Lightning Box used a fun theme this time when they created this game. And it turns out that it is a great escape from all those complicated games out there. There are a couple of features that will make this game even more thrilling at times. But that is not all, the free spins round can be one lucrative game, and aren’t we all in for the wins? For another great engaging game you should consider playing Fat Cat a 5 reel slot by NextGen.